There is further proof that the top stars of the NBA are not treating the FIBA Basketball World Cup, being held in Spain in August and September, with the level of respect that the World Cup organisers would want. It is easy to see why basketball players from around the world are looking forward to the event; it provides them with a chance to pit their wits against the best basketball players in the world. For many players, this sort of event will be the only opportunity that they have to pit their skills and strengths against the players that pack the NBA every week of the season. The thing is though, which this tournament is a big draw for players outside of the league, you find that many top NBA players are not an enamoured with the event as these external players. 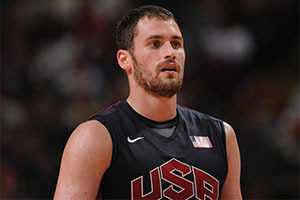 The latest setback for the FIBA World Cup, and for Team USA, is the withdrawal of Kevin Love from the basketball roster. This is down to the fact that the player is currently unsettled with respect to his NBA future and he clearly believes that his time would be best spent focusing on where he is going to in the upcoming season, as opposed to where he will play this summer. The US training camp gets underway on Monday and Love broke the news to the chairman of USA Basketball, Jerry Colangelo, in advance of the weekend. The big reason for the player’s withdrawal can be seen in the fact that the Timberwolves are thinking about trading Love. With the Cavaliers said to be in the running to pair Love up with LeBron James, you can see why Love would be hesitant at putting any move along these lines at risk. It is fair to say that you can get injured at any time and that you cannot wrap yourself up in cotton wool, but if Love went to the FIBA World Cup and suffered an injury, or even an injury in the training camp, which cost him such a major move, it would be something that the player would be angry about for many years to come. There have been a number of dropouts from Team USA in recent weeks, with the coach now having to shuffle his pack and think seriously about his options. The loss of Love is a big one but the team will also be without LaMarcus Aldridge and Blake Griffin, both All Star players. There is also the fact that the team will be without Kawhi Leonard, who was the MVP in NBA Finals. There is still going to be a strong American team at the World Cup, but the air of invincibility that surrounded them is no longer there. This latest drop-out will definitely be good news for the hosts, Spain, who will be many people’s tip for the tournament. There is still an opportunity to place a bet on the FIBA World Cup and with Team USA shedding players every week, it may be that this is the time to look away from the favourite and find great value elsewhere in the line-up.